Maine deep sea fishing is primarily an off-shore fishing trip where we will go up to 45 miles offshore in search of monster fish. One of the most exciting things about offshore fishing is that you never know what you may hook into and how BIG it will be. Cod, Haddock, Pollock, Hake and cusk are some of the most common species of Maine fish, but you never know when you may hook into a halibut, monkfish, tuna or even a shark when you are groundfishing off the coast of Maine deep sea fishing. The most common method of ground fishing is jigging in waters up to 400 feet deep. The type of jig and bait (if used) will depend on many variables and the type of day. Rest assured that Captain Ron knows how to catch monster fish and that he will use the best methods for any particular day. We use all high end rods and reels and for groundfishing we use 80# braided line so you can feel the bite and catch more fish. Occasionally we may use larger rods and reels if we know that larger fish are in the area like shark or tuna. Don’t wait. 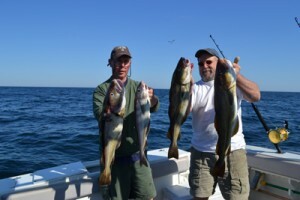 Contact us to book your Maine deep sea fishing trip today!